A wise soul once said there is no place like Home- It is the only heaven on earth. If you are driven by ecological, health and economic concerns and want to make the most of your space available in your home, get ready to begin an enthusiastic space in your balcony that will change the world around you for better. Get ready to explore the pleasure of growing your own flowers and veggies in your balcony garden. At a time when there is a growing increase in the price and excessive usage of chemical fertilizers this seems to be a holistic solution that is cheap, clean and green. If you are looking for house with balcony you can have look for property for sale in Bhopal. Make sure to inform the management about your idea to create a organic garden in your balcony Before starting, check with building management for legal, safety, and especially weight considerations in the building construction plan to make sure that the balcony is strong enough to hold on to such pots. Explore info about the plants you want to grow and study the growing conditions like temperature and hours of sunlight needed for the plant to grow. This aspect will help you design your balcony and help you select the right plants. God forbid, if things don’t seem to work out in your balcony garden in a matter of year it will not be gruesome job to change to something different. Once you have analytically screened out which plants to grow make sure you have the best quality seeds required and the containers to make your organic garden. Te best easily grown plants in a balcony garden are veggies, such as lettuce, coriander, lemon, herbs, chillies and tomatoes, mainly because these plants do not need large space Make sure vine plants such as cucumbers and beans have ample structural support from the beams of your balcony. When you have explored enough on what you want to grow make sure you even take the budget into consideration so that it does not turn heavy to your pockets and help you keep your commitment to house the plants in your balcony for a longer period in life. 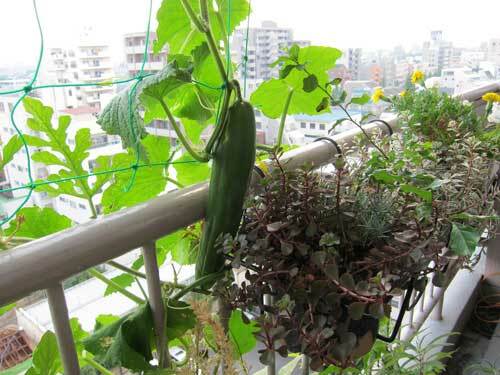 The thought of growing watermelons, bitter gourd and tomatoes in your balcony is sure to entice you. You can enjoy and share the rich harvest of chillies with your neighbour friends. Other smelling herbs such as ginger, lemon grass too can be easily grown. Once you get better with the concept of growing and have hands on experience in growing, you can consider added options for growing voluptuous papayas on trees or baby musk melon on vines in the window sills of the matchbox size flats. You will soon be surprised to know on how much you can grow on the window sills of the smallest flats. You can make optimum use of the skins of vegetables and fruits to create organic manure which is rich in nutrients and allows you and your family to cherish and enjoy chemical free veggies and fruits from your organic garden in the balcony. This experience surely will be one of the biggest and the successful organic farming conducted by you and your family. Consider the efforts of your family to be an effective gradual experimentation process bound to achieve results in the years to come. The best part is your balcony garden will not only take care of all your daily organic waste through composting but also ensure your family a healthier and greener life. The best factor about the produce in your organic balcony garden would be that the produce does not have to be stored and is healthy and cheap. Don’t worry, even if you are a novice at growing plants. A bit of homework will set things right for you. Get ready to be noticed not only by your family and neighbours but also a big thumbs up from “Mother earth” for going the organic way. All the best!! Why Is Window Washing Important For Your Home? Important Factors To Consider Before Choosing A Self-Storage Solution In L.A.